Whiteboarding Mistake Game: A Guide – Physics! Blog! The Mistake Game (which I’ll describe in more detail in just a moment) has become the default mode of whiteboarding (problems, not experiments) in my physics classes. I’ve written about it before (old links at the bottom of this post), but felt like I needed to write again, now that I’ve been using it almost exclusively (as opposed to “regular” whiteboarding) for the past year. I also want to point out some potential pitfalls of using this type of whiteboarding, give some tips on how it has worked best for me, and talk about some of the benefits. I’d better start, though, with a description of what I mean by the “Mistake Game”. What is the Mistake Game? In a moment, I’m going to describe the first day of whiteboarding in my classes using the same sort of style that I use in my model-building posts. I think that will give a better picture of how it looks in my classroom than my trying to describe it. Before that, I should talk a little bit about what happens before we start whiteboarding. The students have been working “individually-together” in groups of two or three on a few problems (not necessarily an entire worksheet) from our packet. We don’t divide up time by the worksheet numbers; rather, we just keep working continuously through, with different students always at slightly different places, then pause when we’ve all done at least a certain chunk (usually about 5 problems/parts of problems) of work. While they were working, I was moving around the room, doing some coaching, but also trying to look sort of unavailable and not like I’m looking directly at their work. That is especially important at the start of the year, before the students “get” the whole groove of the class. The answer-driven, nervous students will seize me if they think I’m available or even just looking at them. They are too eager to check every step of every solution, to scan my face for some tiny signal that they are doing everything correctly, and to ask me questions that I really want them to answer themselves. Later in the year, I won’t worry so much. They know that they are going to be whiteboarding the problems, so they know they will soon have all of the answers available to them. They know that the best way to learn the concepts is the wrestle their way through the problems, so they actually don’t even want me to help. They are more likely to shoo me away, or tell me to stop looking at their work, than to play Clever Hans. In September, though, they aren’t there, yet. They don’t come in that way. They haven’t been allowed to make mistakes before. Not in the way that they’re required to make them in physics class. Right now, it’s scary for them. If a group ensnares me, it will take a long time to get myself detached from that table without making them feel abandoned or frustrated (though they’ll probably feel both anyway, since I won’t answer the questions the way they want me to do). Trying to answer their questions without answering my questions involves a lot of side-stepping, responding with a different question, and explaining of why I’m not being as helpful as they’re used to teachers being. In the meantime, I’ve missed out on hearing the discussions, arguments, and resolutions at the other tables, so I’ve lost the pulse of the class for several minutes, and I need to get reoriented. Eventually, I know that all of the tables have done the first 5 or 6 bits of work. It’s time for our first ever whiteboarding session. I’m psyched; I love whiteboarding! Hey everyone, can we pause for a couple of minutes? We’re about to do something for the first time that we’ll be doing really frequently this year. It’s called “whiteboarding.” Let me tell you a little bit about how to do it, then we’ll try it out right away. In a moment, not yet, each group will need a whiteboard and a marker. Each table will write a solution to one of the problems on their board. When you’re finished writing it, you’ll take your board and put it up backwards on the ledge of the big board up front. When all of the boards are up, we’ll know we’re ready to start. Each group will get the chance to come up and present their solution to everyone. Oh wait, I forgot an important part! There’s a little wrinkle in the solution-writing part of whiteboarding. When we whiteboard in this class, we almost always play the Mistake Game. So the wrinkle is that you have to include at least one intentional mistake in your work. You can also include as many unintentional mistakes as you’d like. For your intentional mistake, you should be trying to make a really good mistake. That means it should be something that you think your classmates might actually do. A lot of the time, a good way to come up with a quality mistake is to use something you actually did wrong when you were first solving the problem. Let’s try to avoid Where’s Waldo? types of mistakes. So your intentional mistake should NOT be something like labeling the axes backwards, changing a number in an arbitrary manner, or spelling your names wrong. You might do some of those things unintentionally, but for the Mistake Game, you’re goal is to include a really quality, conceptual mistake that will lead the class to a good discussion when you present your board. Are we all ready? Excellent. Now I need to tell you what your job is during the boards that you’re not presenting. For everyone not presenting, your job is to ask questions of the group up front. If you think there is something they need to change about their board, you need to ask them questions to get them to change it. Asking questions is probably (definitely) the hardest part of this whole process. Okay. So examples of bad questions: “Isn’t that part wrong?” or “Don’t you think you should change it to be like such-and-such?” Okay, any statement that you’ve basically just put a question mark on the end of is not going to be a very good question. Good questions usually try to lead people to seeing an inconsistency or contradiction in their work. And you’ll get better at asking questions, too. It will take time. Now, at the beginning of the year, a lot of times students have an impulse to look at me while they are presenting or while they are asking questions after the presentation. I’ll help facilitate the conversation a lot today, but one of our goals it to get to the point where you don’t really need me to talk during whiteboarding. Okay, before you get worried that you’ll never know what the “right answer” is in this class, let me tell you a couple of other things. First, I’ve read about how these kinds of group discussions work—even if everyone in the room has the wrong answer at the beginning, as long as you don’t all have the same wrong answer, you’ll end up with the correct one through the discussion. So that’s one of the reasons why I tried to get you to keep from checking with all of the other tables while you were working—I wanted to make sure that we preserve diversity in any of the wrong answers. And second, I’ll obviously let you go up with a wrong answer on your board, but I won’t let you sit back down with one. If you ever finish your discussions with a wrong answer, I’ll chime in with a question or two at the end to redirect the conversation. What I’ve found, though, from my past classes, is that I actually very rarely have to do that. You guys tend to do a really good job with these discussions. One two last comments before we get started. Remember to be nice to each other. So none of the… “That’s wrong and you’re stupid!” type comments, right? And also remember that you never know whether a mistake on the board was intentional or not, so be gentle. Finally, for the people presenting—you shouldn’t act and draw it out when you are asked a good question that addresses an error on your board. Even though you put the intentional mistake in your work, you don’t have to act like you’re totally and hopelessly confused about the mistake. You can acknowledge a good discussion and make the change pretty quickly when it happens. But also don’t jump to change the board after a question that just hints at how to fix the mistake. It’s sort of a balance. We’ll figure that out along the way, too. After trying it myself, I completely recommend starting the year with the Mistake Game as the primary way of whiteboarding problems. It was a good way to teach the students how to have effective whiteboarding discussions. Asking questions to uncover the intentional mistakes sets up an artificial, but comfortable, way of showing students how to have a productive conversation that leads to an increase in understanding. At the start of the year, when the problems are relatively easy for the students, it also helps isolate those difficult discussion skills from confusion about problem solving. The following comparisons are based on my observations of students in my classes before and after I started using the Mistake Game. Without mistakes: Student presentations often consisted of them standing silently next to their board, occasionally pointing. It was awkward, and they didn’t know what to say because they assumed that their work was self-explanatory and that everyone already had the same work. With mistakes: There is an obvious need for explaining their work, since they assume it will be different from everyone else’s. Moreover, the way to explain their work now seems clear—they must walk their peers through their thinking so that their mistake will be highlighted. Without mistakes: When a group presents a board with a wrong answer, the atmosphere in the classroom gets increasingly uncomfortable. Often, the error is pointed out very quietly, and an embarrassed group member quickly edits the board, hoping to cut off any discussion. With mistakes: Errors are a normal, expected part of every presentation. In the case of an unintentional mistake, the presenting group always has the option to act as though it were intentional. Remarkably, most students feel no need to “cover up” their unintended errors. Since mistakes are expected, they feel okay about both making one (or two or three) and having a discussion about it. Without mistakes: If there are no immediate comments or questions, the presenting group often tries to put their board away (below the big whiteboard) and go back to their seats as quickly as possible. The teacher often has to keep the group up front long enough for anyone who has a different answer on their paper to formulate a question. With mistakes: After many presentations, there is a comfortable period of silence while everyone scrutinizes the board in front of them. Sometimes there are immediate questions, but sometimes it takes time to find and digest the mistake(s). Since everyone knows there is at least one thing wrong with the board, there is a need for that quiet reflection. The presenting group does not make haste for their seats because their mistake hasn’t yet been resolved (some groups do still try to run at the first opportunity, but that opportunity comes later). Without mistakes: Students vied to be assigned a problem they knew they had done correctly. If they weren’t already sure about an answer, they try to check with as many people as possible, including the teacher, before putting their board on the ledge. With mistakes: When groups are assigned a problem that they aren’t sure they’ve correctly solved, they don’t worry. They write as much as they can, knowing that by the end of their presentation, they’ll know how to solve the entire problem (with the help of their classmates). There is no right-answer anxiety from any of the groups while they are writing on their boards. Without mistakes: Especially in the regular classes, little thought is put into conventions and format when writing on whiteboards. No students ever correct mistakes in symbol use, axis labels, etc. The teacher is left to ask these picky procedural questions at the end of every presentation, much the annoyance of everyone (teacher included). With mistakes: Students are delightfully picky about each other’s work. They have permission to be respectfully picky without having to be a jerk (and also without leaving the teacher to be the jerk). Students think about symbol use, labels for graphs, formatting for algebra, etc when writing their whiteboards. Good habits are reinforced. A secret of the mistake game—it’s actually the best test corrections ever. Over the course of the year, as the students get better at making worthwhile mistakes, something wonderful starts to happen. Students start to work out their mistakes from old tests by, I guess, role playing them in front of their peers. They present a problem using a mistake they’ve made before, but this time the joke is on the mistake. This time, the student knew it was a mistake all along. Even better—especially near the end of the year, students express pride in a particularly good mistake. When that happens, it is almost always about an old mistake that they are now showing mastery over. That’s not to say that students aren’t thinking of great conceptual mistakes that are original for them; rather, students are just exceptionally proud of exorcising an old demon. That’s all great, but how do I win the game? Okay, you’ve got me. It’s not really a game. At least, it’s not a competitive one. There’s no winning. No awards. No badges. No rankings. I don’t build it up as a game, though, and I haven’t yet had any problems with students wanting to “win” it. Over the past year or so, it’s been really fun to hear from other teachers about how they’ve used this whiteboarding strategy in their own classes. Among the situations I’ve seen in my own classes, as well as stories from other teachers, I’ve recognized some ways that the activity can get stuck in a more inefficient/ineffective rut. Here are the ones I’ve heard about or seen so far. I’ll add to the list as I hear about or experience others. Misspelled names (no, seriously), arbitrarily changing a digit in the solution (often without that change even affecting the rest of the work, though it should have), switching the labels on the axes of a graph—I see these the most near the start of the year. I’ve also heard a lot about these. Sometimes they seem to be generated by a misunderstanding of the game. If students think that the goal is to hide a mistake in their board, Where’s Waldo? is clearly the way to go. It’s hard to argue with a classic! Of course, the goal of the Mistake Game isn’t to hide a mistake. Everyone already knows that your board has a mistake. The goal is to generate good discussions by working through errors in reasoning and understanding that are likely to besiege a few students in the class at one point or another. 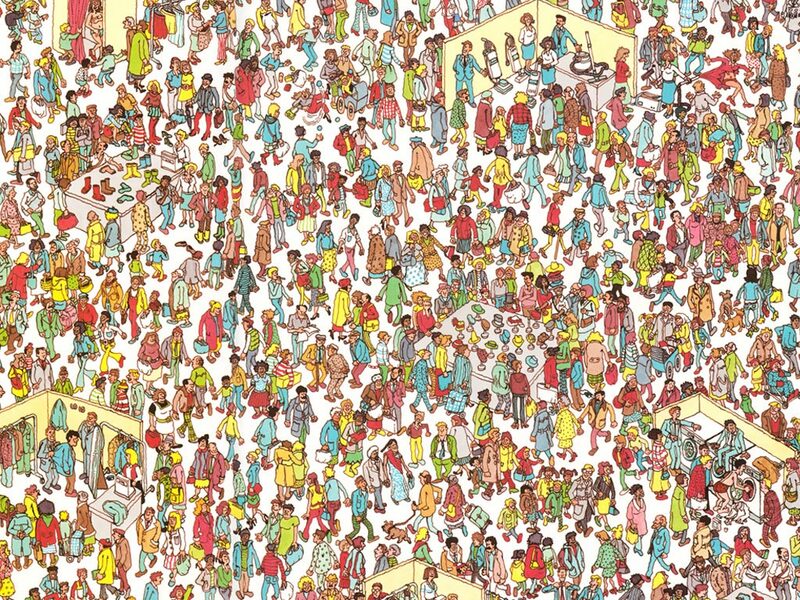 The other main source of Where’s Waldo? types of mistakes is probably weak metacognition skills (or a weak understanding of the problem—or a combination of those two). It takes a while to develop the ability to think about how you might go wrong while working a problem, and although students have been making mistakes for years, they haven’t often been asked to make them on purpose. So they probably need more guidance, to have good examples pointed out when they arise, and time to practice. Some of the best, most productive, and funniest results of playing the Mistake Game come from situations where students either (a) think that they wrote a board with no mistakes (yes, everyone think’s they’re hilarious for thinking of that mistake at the beginning of the year) or (b) think their board still has an error when it is actually correct (that is, they thought the correct solution was actually a mistaken one). In the first case, the “no mistake” board almost always contains the most unintentional mistakes of that batch. In the second case, rather than running back to their seats, the presenting group tends to stand around for a while at the front, even though no one has any more questions. Both of these possibilities could lead to uncomfortable situations, but again, with the mistake norming that is being done on a daily basis through the whiteboarding routine, the presenters are usually good-natured about it. I guess this one is actually more of an anti-pitfall, unless the “we didn’t make a mistake…!” becomes a routine. If there is a student or group who is really intent on not making (intentional) mistakes (I haven’t had this happen, but I could imagine such a student), one option might be playing Mark‘s Mistake Game spinoff: the Mystery Mistake Game. It is exactly the same, except that each group may choose (without telling the other groups) whether or not to include an intentional mistake. This is a complain that I haven’t really seen myself. I haven’t timed it, but adding mistakes hasn’t seemed to make my whiteboarding process any longer than it was before. Of course, whiteboarding at all is going to take much longer than lecturing or “going over” answers to problems. If you make the jump from no whiteboarding to whiteboarding with mistakes, it will probably take a lot more class time than originally planned. I suspect that much of the other taking “forever” aspects come from the other items on this list, so the solution is probably to attack those problems. If the time problem seems to happen while students are writing the whiteboards (rather than during the discussions), having a timer somewhere visible might help students become more aware of the time they are spending. I also find the “put your boards up backwards” part of my process to be helpful here; a slow group will see that the other groups are visibly ready, even if they are chatting, because the boards have been accumulating at the front. That can help keep some groups on track when they were wandering, as they start to realize that the class is waiting for them. In my regular classes, we tend to whiteboard every problem that we do (though we don’t always do every single problem in the packet). In my honors classes, the students tend to get pretty good at knowing which problems they think are worth whiteboarding. They usually want to skip the discussions for problems that they already feel confident about, and that can save some time, too. Of course, I just have to be careful to make sure that I always agree with their assessment of problems that are “skippable” during whiteboarding since they don’t always know when a problem has some extra subtlety that will make for a good argument in presentations. I saw a lot of this one when I was first trying out this activity and hadn’t yet completely understood what would work best. It can be a little tricky at the start of the year to calibrate the “acting” required in presenting boards with mistakes. Basically, when they talk through their written work, they should include the mistake fluidly with everything else. Once the presentation shifts to answering questions, they should stop acting as though they totally believe their mistake and instead fix it when prompted by questions. They shouldn’t, though, fix the mistake in response to really poor or irrelevant questions. They can engage the asker a little. The problem comes when they take that engagement too far, or when they respond with mock-confusion to even decent or good questions. So. Part of the fix here is just a little teacher intervention when it happens (one of the reasons why I talk more during whiteboarding in the first few weeks than I typically do during the rest of the year). The other fix is making sure that the students really understand that they aren’t supposed to be “hiding” their mistakes. The jig is up; we all know you have a mistake. Ignoring the naked numbers in that statement, the real problem is two-fold: (a) it is not a question and (b) it is about the student’s work, not the presented work. I usually intervene immediately when “questions” like this arise, whenever they happen. “Ask about their work, not your work.” If the students have enough time to be quiet and thoughtful after a presentation (instead of rushing to ask questions or move forward to the next problem), then the problem is usually not that they don’t have time to compare the work on the board to their own. In that case, these questions are probably symptomatic of a larger problem: the students talk sequentially, not to each other. That is, they wait patiently to make their own statements (usually not listening to anyone else—except maybe the teacher) instead of responding to classmates. They often make the statement to the teacher. They are stuck in an individualized view of school and are used to learning next to, not with, other students. I am still working to get my regular students up to the level of discussion that I’d like during whiteboarding. When I’ve had success at changing this mindset/behavior, it’s been due to short talks with the class about what great physics classes do (subject of a future post, hopefully). I basically start a class one day with a quick 2 or 3 minute chat about how I think they are a really decent class, and about how I want to share something I’ve noticed about what really great physics classes do. Then I tell them about talking to each other, making each statement a response to what has been said by someone else. I’ve seen really huge changes happen with just those kinds of short talks in an honors class this past year, and I’m hoping to try to apply it more in my regular classes this fall. I think the key is to remember that they don’t know how to have those kinds of discussions in physics class. So patience and some explicit, well-timed pointers seem to help them develop those skills. This potential pitfall is such a big one, the headline deserved a bigger font. Asking good questions of the presenters during whiteboarding is one of the most challenging things I ask students to do all year. And I start asking them to do it around the second or third day of school. Every student will have trouble coming with questions that highlight contradictions and that aren’t just statements with a raised voice at the end. What I’ve found to be most helpful is pausing the class, acknowledging how difficult it is to formulate good questions, asking for a reworded question, and occasionally rewording a question myself to help show them how to do it (and especially to interpret the meaning if I know what they are trying to ask, but the presenters are at a loss about how to understand/answer the question as posed). Critically important to that whole process is allowing silence and thinking to happen without trying to rush to the quickest solution. If a question is badly phrased, I try to let the same student ask again instead of letting someone else just jump in. Without letting them reword it, that student won’t move forward in his skill, even though the class might resolve the problem by having another student ask a great question. I want all of the students to keep wanting to participate, and I want all of them to get good at asking questions. Another question-asking difficulty—some students only ever want to ask questions of me, never of the presenters. The Mistake Game itself does help refocus those students, but some persistent ones will still exist. If they turn to me before or while asking, I just point back up to the front of the room (I always sit/stand at the side or back during presentations). If they say that they have a question for me, I direct them back to the presenters anyway. They will usually ask the presenters if I insist, thinking (I guess) that I will answer their question once I hear it and realize it is actually for me. The presenters almost always do a really nice job answering the generalization question in those cases, and I’m always glad that I gave the students up front that opportunity when I hear their responses. Final note about asking questions: A lot of this blog post, and especially this section, was prompted by reading this post about confidence in reasoning (and having a discussion in the comments). More good thinking about setting up discussions among students is contained over there. This sounds like an excellent way to “loosen” up the whiteboarding discussions and to relieve the inevitable tension about making mistakes. It does put a very high premium on actually understanding the details of the problem, but, hey, that’s what it’s all about. The “I got 5 for the velocity” and “asking questions is tough” are just reflections of the enormous difference between what’s involved in just revealing the bottom line and exposing your entire thinking process and overcoming the gulf of comparing that process with how someone else solved the problem. This is certainly a non-trivial issue; it involves self-awareness and self-reflection, plus the capacity to figure out what someone else is thinking, and to express that relationship in words – so it’s not surprising that it needs continuous attention and not all kids will be at the same stage. I guess the issue is how to manage the process most effectively. Particularly, how to keep the kids who are relatively good at it challenged and getting better, and how to keep the kids who are not so good, or have no clue, trying at getting better and contributing what they can, and not getting too discouraged by the fact that others are better at it than they are. And that’s really so important for kids – their own perception of their own competence and how they are comparing with their peers. I think the fact that the problems are always new keeps it engaging for the kids who find it easier to participate in the discussion. There are always at least two simultaneous challenges to tackle: learning the new physics and having a good discussion with classmates. Simply Brilliant! I am going to try this next fall. I had lots of trouble with the Where’s Waldo mistakes this past year, as well as trying to keep everyone involved and asking questions. Part of that is class size (five groups is somehow entirely different from eight or nine groups). Part of it is me needing to get better at not getting sucked into interacting too much with them while they’re working. And part of it is definitely needing to emphasize how difficult making and discussing quality mistakes really is. I think it might be helpful early on to pause after a good (or at least decent) discussion of a problem, let the kids up front sit down, and then have a new discussion about other good mistakes that could be made in that same problem. Since they’ve just done a lot of thinking about it, it seems like they’d be responsive and ready for thinking about lots of different mistakes that could be made. That might help some of them start to see how to do that themselves for future problems. I’m still doing some thinking about how to work with larger classes. I will try to come up with some ideas, though I won’t know how well they will work. I think the largest class I’ve had whiteboarding all at once was only 16 or so (in a summer program for middle school kids a couple of years ago). Let me know about your ideas for that, too, as they develop. It’s definitely a section that needs to be added onto this post sometime soon. Love the idea of trying some version of this (maybe “Mystery Mistake Game” so that students are constantly thinking about whether something is right or not and it’s okay in their minds either way as long as we discuss and make progress as a group) in high school math – thanks! Yay! Please let me know how it goes if you get a chance to try it with your classes. 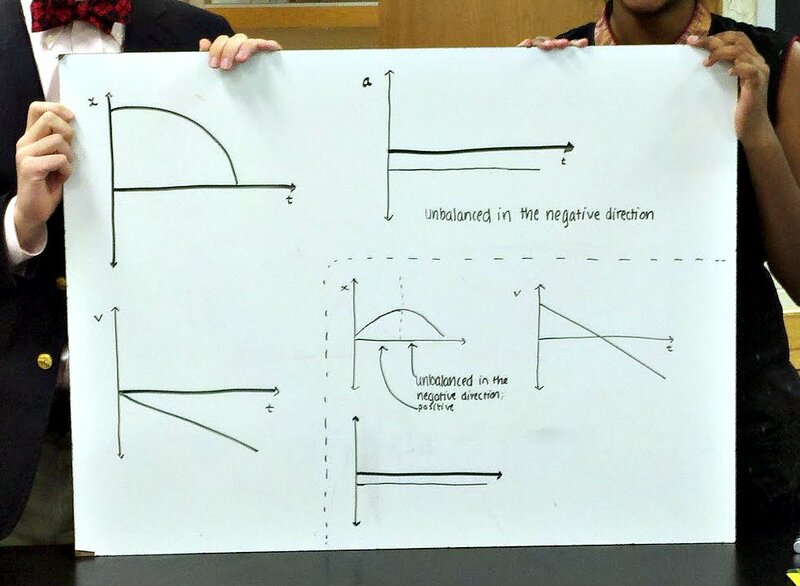 My physics teaching team will be incorporating whiteboards this next year, and this post will be an excellent reference for us to effectively use them when problem-solving. I wonder if you can address an issue touched on by jsb16: We made the move to whiteboards to encourage more active learning by all learners. When we have had whole class discussions, it seems that a handful of students dominate. It seems that a lot of the power of the mistake game lies in the whole class asking questions of the group presenting in order to expose the mistake. How do you make sure the whole class is actively involved in this process, or is it even a problem? 1) Require some silence after the presentations before letting the presenters call on their peers so that everyone has a minute or two to let their thoughts develop and the quickest hand-raisers don’t always dominate. 2) If it’s a really large class, maybe occasionally have it set up that when a group finishes presenting, they’re responsible for asking the first question of the next group (or something like that). That could even out the discussion a little, but also not overwhelm individuals (since there will be at least two or three (or four) people on the spot instead of just them). I’d worry about using that all the time, though, because it might put the rest of the students into a more passive stance, knowing that they don’t have to ask a question right away when it isn’t their group’s turn. 3) For really large classes, if the whole class discussion just doesn’t work, I could imagine splitting them in half and having each discussion twice (with the rest of the students working on the next set of problems “individually-together” on the other side of the room). Might be tricky, but I could imagine it working pretty well if the class bought into it. Maybe have both groups write their boards a the same time, then half just go work for a bit during the first discussion. That way, they wouldn’t feel any pull to “steal” mistakes from the first group or anything like that. If I did that, I’d probably put the answers (not solutions) to the problems somewhere in the room where students could go and check them. That would help them feel more confident about their small group work when the teacher wasn’t as available to talk to them. Do you usually have all of the students work through all of the problems before having a large class discussion? If not, that could definitely help more students be ready to jump into the conversation. Most should have had good small group discussions about it already while doing the work, so they’d feel more confident about their own ideas. The description of pitfalls is and problems is excellent. I’ve been planning on using the Mistake Game frequently next year & it’s extremely helpful to see your reflections on potential issues. The main pushback I foresee will be at the beginning of the year just getting students used to a way of “doing school” that will most likely be very different from what they’ve done/are doing in their other classes. You touched on that issue a little bit in the post, but have you had issues with that problem persisting for some students? In prior teaching experiences, I’ve had some classes really struggle when taken away from a teacher-directed environment simply because that has been their experience in all their other classes for the last 10-11 years. And yes, yes, YES to the stubbornly teacher-driven student. I had a major success with one of those this year (though I don’t think I really won him over until sometime in May), but I’ve also had students make it all the way through the year convinced that I was just hopelessly confused about what teaching should be. Most of those were in my first couple of years, but I definitely had one this past year who was very stubborn about refusing to do my class (and who managed to significantly limit the amount of physics she learned, unfortunately 😦 ). I try to keep focused on how the problem is mainly what has been done to them in classes before, so that I can stay patient with them. I also try to talk to advisors (in most schools, talking to parents would probably be the more equivalent way to go), and I try to keep anyone else relevant informed (academic deans for that grade, etc) about how things are going. I also try to talk to the student as much as I can outside of class, develop a broader relationship with them, and try to get more trust from them that way. Also, just explaining why for all of the crazy weird things we do in physics class, and repeating those explanations at intervals throughout the year (especially in the first quarter or half of the year), seems to help a lot. And giving them lots of little opportunities for feedback (and listening to the feedback earnestly) is also good. I think another thing that helps is that I try to make things pretty organized and structured, but I try to use the fewest “rules” possible. I try to give them a lot of space to slowly (if they need that) come around to thinking this way of learning is great (and almost all of my students do write very, very enthusiastically about how great whiteboarding is, no matter how positive or negative their other comments about the class might be). This is one of the best blog posts I’ve read all year. In my high school math classes, I struggle a lot with getting students to ask good questions, and specifically with getting them to ask these questions of each other. I’ve been considering introducing some sort of problem-solving activity using whiteboards in small groups, but I hadn’t considered using this kind of presentation approach (or intentional mistakes). Lots of good ideas for me to think about here; thanks for sharing this in such detail. And if you want to chat more about whiteboarding in general (this post sort of assumes some familiarity with it, I think), just let me know. One of the biggest problems students have is learning how to ask “good” questions. If you think about it though, when were they actually shown how to do it? I have many teachers that use the Q-Matrix to introduce questioning: http://www.fcps.org/cms/lib02/MD01000577/Centricity/Domain/98/reworked%20Question%20Matrix.pdf Students need to understand that lower level questions (ones that are typically asked) are found in the upper, left corner of the matrix. As you move “away” from that corner you are creating questions with higher levels of thinking. It is VITAL that teachers model using the matrix and let kids know what kind of thinking will be involved. Ideally this would start in the early grades so by the time the students get to middle school they have many experiences generating and analyzing types of questions. Hi Kelly. Thanks for taking the time to write up such a comprehensive post on this. I found a lot of your tips to be helpful in thinking about running whole-class discussions in general, not just mistake game ones or whiteboard ones. You rock! great blog! I’m going into my 1st year teaching and will be implementing modeling in both physics and chemistry so posts like this are incredibly helpful! thank you! One thing I was wondering though, maybe I just didn’t read close enough, what questions are the students actually trying to answer? Meaning, what type of problem are they given by you to solve? Is it physics-based or just something that they can all connect to? Additionally, are they all given the same problem?? Generally, we whiteboard everything (except for experiments) with the Mistake Game. So all of the problems from the Modeling worksheets (though I use a fairly modified set, not the “canon” set). I very rarely have them all whiteboard the same problem. The most usual case is that everyone works for a while on the packet. Once everyone has finished 5 or so problems, each group tackles one of those problems to whiteboard. Then we present. Lather, rinse, repeat. I’ve been thinking about this, but have just put it off so far with the other new stuff I’m doing so far this year. The mistake version might just get me motivated to jump in. I’ll post about it and link to this page if I do. Thanks for all the details. Hi, I’ve been teaching physics for the past 22 years and I’m about to embark on a new path using whiteboards…I hope that my teaching experience will come in handy because I don’t have the faintest idea of what I’m getting myself into…. I have used whiteboards for the past couple of years but love the idea of the mistake game. I’m definitely going to give it a try this year! I especially like the “without mistakes” vs “with mistakes” comparison. I’ve been struggling with lackluster results of whiteboarding for the past year, and I saw my class in the “without” examples. I am going to give this a try this fall. Thanks for the idea. Such a great idea! I wish my teachers had done this when I was in school!